Join me this Friday night (tonight) at 9PM as I summarize and play various reactions to U.S. Ambassador Kenneth Merten's recent visit to Brooklyn where he purported to offer a Retrospective of US Foreign policy in Haiti after two panelists who conveniently spoke only of Haitian government weaknesses. Merten's remarks looking back at US Foreign policy in the last 20 or so years were very short and he scraped the surface of the many serious blows dealt to Haitian rice farming, the Black pig and to the country's infrastructure through the 90s embargo. But most of all, Merten bamboozled the community when questions were raised about his involvement in announcing election results in 2010 that were contrary to what two electoral council members and a former OAS official found to be the actual result. 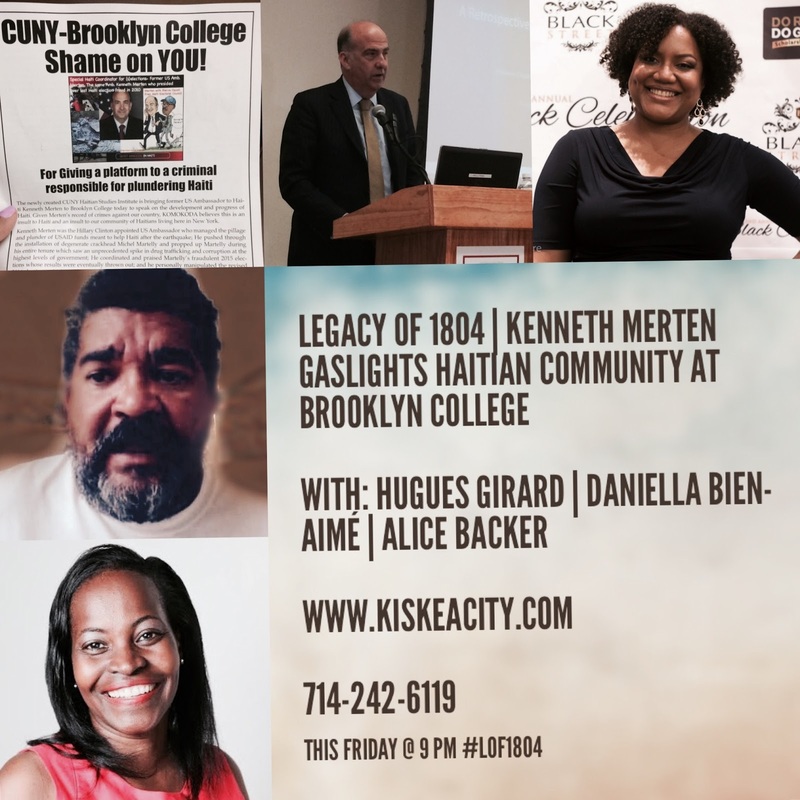 The event was protested by KOMOKODA, a grassroots organization who felt Brooklyn College should not have invited someone with Merten's destructive policies towards Haiti to speak at the new Haitian Studies Institute. Listen to reactions by Dahoud Andre of Komokoda, Daniella Bien-Aimé of the Bien-Aimé Post and Hugues Girard, among others. You can listen live or archived at the below player or at http://www.blogtalkradio.com/pancaribbean/2017/04/01/legacy-of-1804-amb-kenneth-merten-bamboozles-haitians-in-brooklyn-lof1804. You can also listen live only at 714-242-6119. Another amazing show full of serendipity what with Professor Claude Joseph, one of Merten's co-panelists calling in to offer his views of the event. We were also joined by none other than Dady Chéry of the News Junkie Post who offered, along with Hugues Girard, that listeners and guests of this show need our own think tank, one not commandeered by the State Department or dismissive of the protests and concerns of entrenched Brooklyn community groups such as Komokoda. We listened to clips of questions asked of Merten at the event by Daniella Bien-Aimé and me respectively on Merten's changing of official elections results in 2010 and the US' role in centralizing the Haitian government in Port-au-Prince. We also discussed panelist Vanessa Léon's implied thesis that the problem with US Foreign Policy in Haiti is Haitians and the Haitian government.